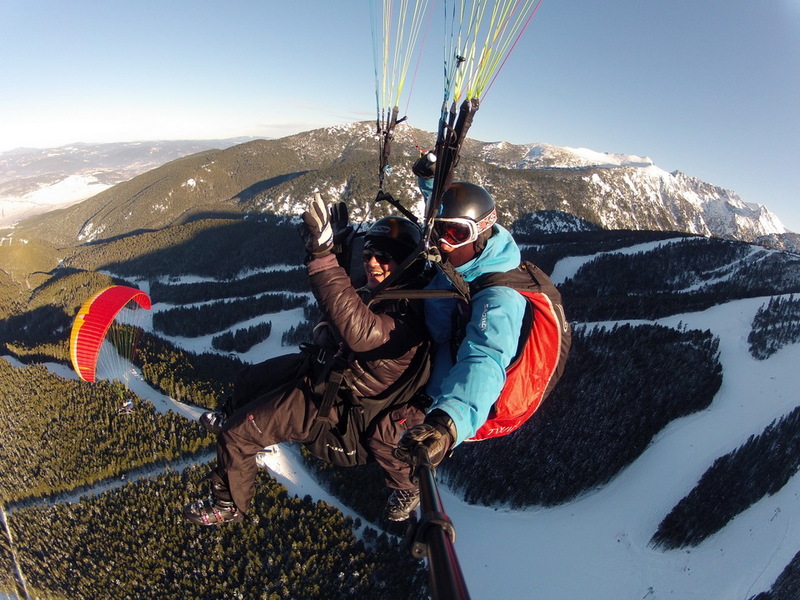 Tandem Flight (including Photos and Video) 220 lv. We can also provide 360-degree pics (3-5 per person) and video can also be 360-degree. Please note that we can now take card payments up the mountain. What is the minimum/maximum age to fly? 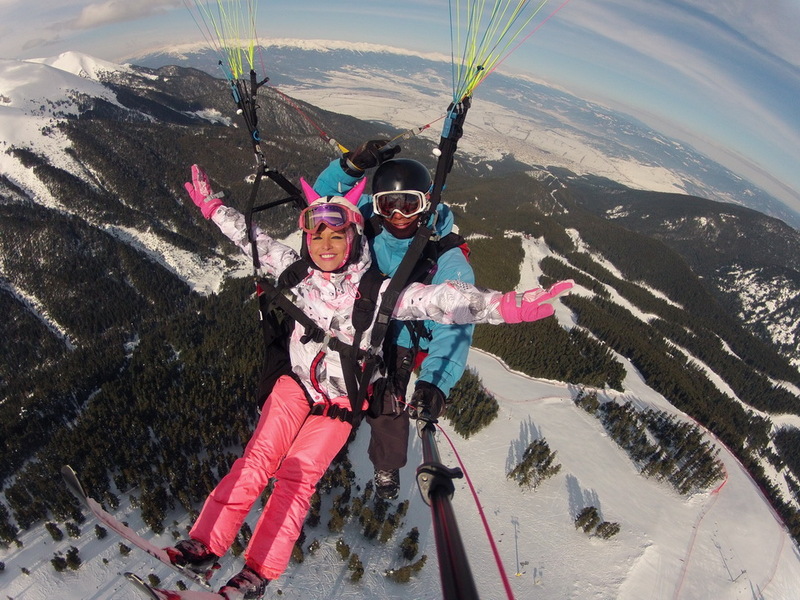 Almost anybody can partake in paragliding. We have flown passengers from 4 to 72 years old. Is there a weight restriction to fly? As each canopy has a limit on how many kilos it can carry, our pilots are carefully matched to each passenger according to their combined weight and the weather conditions. We currently enforce a weight limit of 120kg (18.9 stone) but everything depends on the weather conditions. If the wind is not suitable for heavy passengers, the flight will be postponed. How long will I be in the air? During the winter season we cannot guarantee precise flying time. Average time in air is around 10 minutes. Sometime we flying more or less depending is on the weather conditions and how heavy the passenger weight is. For example: 1000 meters is the difference between take-off and landing. We descend at 1.3 – 1.8m/s. This makes 666 seconds in air or 11.1 minutes. If we make any acrobatic manoeuvres (the safest and easiest manoeuvres like wing-overs or spirals) then the descent speed is increased and therefore the flying time will be less than 10 minutes. However, in this case, the flight is more exciting, like a roller coaster! What do I need to wear? We provide a safety helmet for all passengers. You need to wear comfortable and warm clothing. Gloves and sunglasses are a necessity. 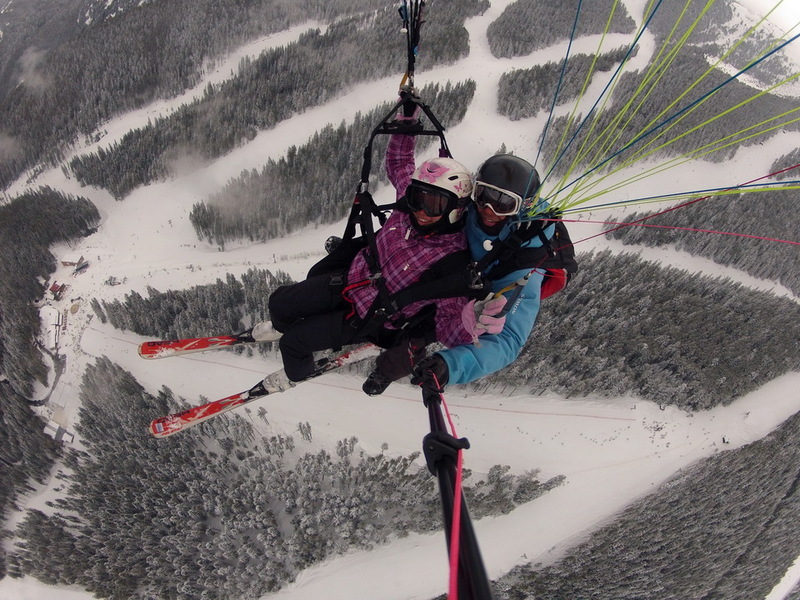 During the flight the temperature drops – don’t forget that the take-off altitude is 2500m. Do I need any training or experience to fly? Absolutely not. No experience is required to fly as you will be fully briefed prior to take off. You will merely run a few steps and the rest is in the hands of your fully qualified pilot. Just sit back and enjoy your flight. Skiers can take off with skis (it doesn’t matter what level your skiing ability is). 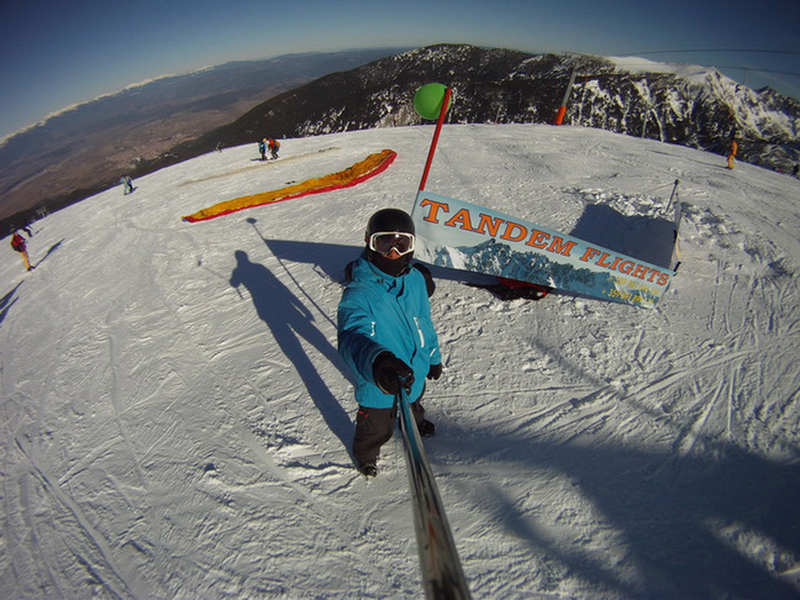 We are also ski instructors and will advise on how to take off with skis or from a running start. Snowboarders will run! At what time can I fly? We start flying when the lifts open at 09:00 to 16:00. How do I get to the take-off point? It is best to understand in advance where you will meet – please contact us. Places for take-off vary depending on the wind. Landing is always Banderishka meadow (upper gondola station). Can I book/pre-book my tandem paragliding flight? Yes, you can. 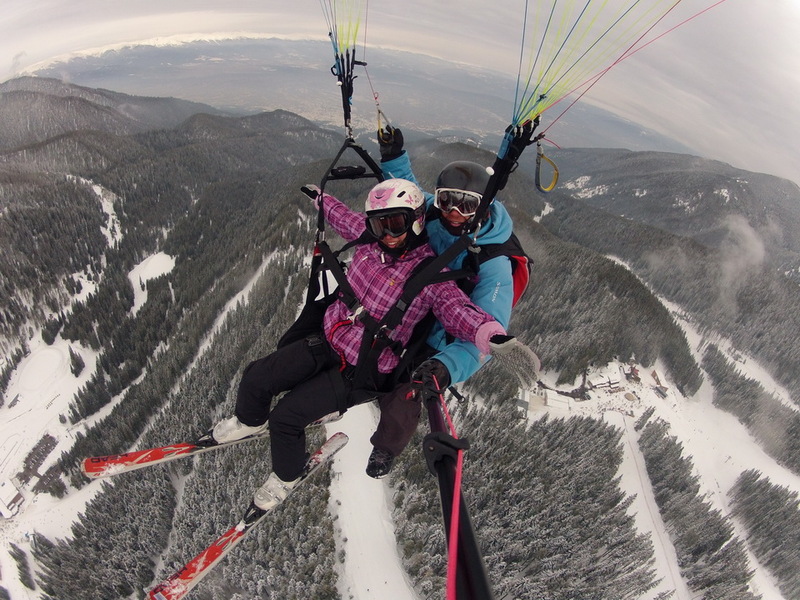 The weather is changeable though so do not leave your paragliding flight to the last few days before you go home. It is best to contact us so that we can discuss the best possible day for you. Please note that we do not allow passengers to use their own cameras. Transport up to the mountain is not included and passengers must have a valid ski pass.